I remember seeing John Landis’ “An American Werewolf in London” on VHS when I was 16. I remember being so mad at the way it ended that I told myself I didn’t like the movie…and then, shortly after that, I bought the DVD and a T-shirt with “BEWARE THE MOON” (a line from the movie) sewn onto it. Yet, I was still convinced I didn’t like the movie…which is why I watched it countless times since then? It took longer than I’m proud to admit for me to realize I did like the movie…I just didn’t like the ending. “An American Werewolf in London” is a horror film with a sharp satirical sense of humor that makes for some uncomfortably funny moments. It begins with two American college students—David (David Naughton) and Jack (Griffin Dunne)—being dropped off in English country with a truckload of sheep…considering everything that happens to these two, I won’t even call this “subtle” foreshadowing. David and Jack reach a local pub (called The Slaughtered Lamb) in a small village, a place that already seems disconcerting without the angry glares from the patrons and the barmaid. Before they leave, they’re warned to keep walking on the roads, stay off the moors, and “beware the moon.” Well, it’s a full moon out that night, and they ignore the warning and walk away from the road…and that’s when they are attacked by a ferocious creature in the dark. Jack is killed, while David is hospitalized in London after being mauled by the creature. But the problem is no one, not even the police, believes his story that it was a large wolf that attacked them, since it was the corpse of a man that was uncovered at the scene of the crime, not a monster. While David is recovering from his injuries, he suffers a series of strange, harrowing nightmares, all of which involve him attacking animals and eating them (among other horrific details). But things get even stranger when Jack, now a decomposing corpse walking in limbo as one of the undead, visits David and warns him that he is becoming a werewolf. It was a werewolf that killed Jack and merely mauled David, and now, the curse has been passed on to David. If David doesn’t kill himself before the next full moon, he will become a monster and kill people. It turns out Jack was right (of course), and on the next night of the full moon, David transforms into a werewolf and goes on a rampage. 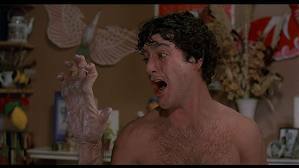 What everyone remembers from “An American Werewolf in London” is the transformation sequence, which shows the painful process of becoming the wolf-like creature. Makeup-artist/creature-creator Rick Baker supervised the effects, working with the makeup and prosthetics, and the result is not only effective but also one of the most amazing, memorable, lasting moments of its kind I’ve ever seen in any movie of its sort. 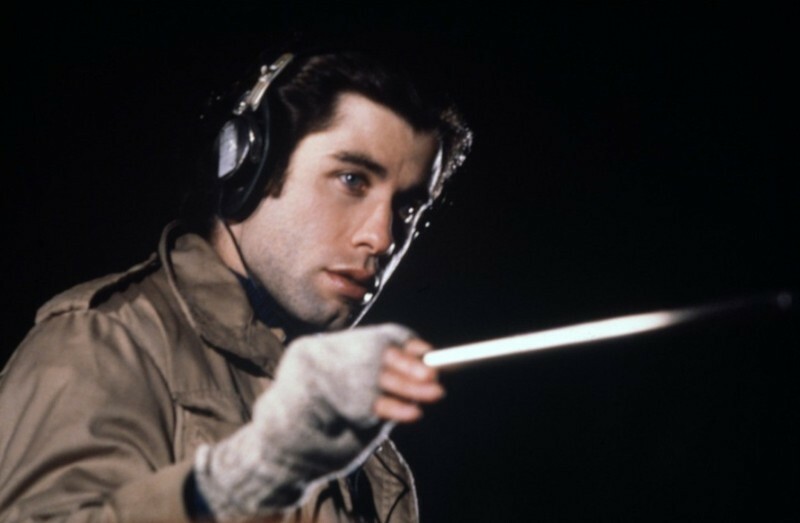 (Baker won the Oscar for Best Makeup for this film, becoming the first winner for the category that was new at the time.) Carefully chosen cinematography and effective acting from Naughton make you feel the pain and suffering David is going through as his body goes through slow, numerous changes before ultimately becoming the American Werewolf in London. “An American Werewolf in London” works well as a horror film, not only because of its effectively done scary set pieces (such as the boys’ first werewolf attack or a later attack in a Subway station) but also because we care for the character of David and feel sorry for him while he’s in this uncontrollable situation. But it also works as a black comedy, thanks to director Landis (who’s known for outrageous comedies like “Animal House” and “The Blues Brothers”) who inserts many nice elements that are fun to laugh at. The most memorable and relevant of such elements comes with the character of Jack, who after his death visits David three times. Even though he looks worse and worse with each visit, as his body is slowly wasting away, Jack maintains the persona of a perky college student that makes for great comic relief. Something else that keeps the rooting interest of the film going is a nice little romance between David and his nurse, Alex (Jenny Agutter), who takes him in after David leaves the hospital. It’s sweet without being sugary, and you feel the attraction between the two. Much of the reason we want David to find some way to get through the curse is because we know Alex feels deeply for him. And then there’s David’s doctor, Dr. Hirsch (well-played by John Woodvine), who discovers there may be more to David’s story than he initially thought and does his own investigating. This subplot would be uninteresting if the part wasn’t played by an interesting actor who helps keep the film grounded in reality. OK…let’s talk a little about the ending. Without giving away what happens, I still don’t like it. I feel like the film does so well, right up until this final minute or so. It feels so anticlimactic that it made me wonder why I spent so much time leading up to it. It let me down with how abrupt it was. But the more I thought about it (and I’ve watched this film several times), I might give the film a little bit of credit that there might not have been any other way it could’ve resolved itself…but I don’t know if I can forgive the film for immediately cutting straight to the credits with an upbeat pop song that tried to make me forget the utterly dire resolution I was just subjected to! However, I can’t let something like that get in the way of the delightful horror-comedy I enjoyed for years (even if many of those years were spent in much denial). “An American Werewolf in London” is very well-made, contains Landis’ trademark blend of lightheartedness and weightiness, and may just be the best “werewolf movie” I’ve had the pleasure of seeing. Well, first, let me talk about the “no more wire hangers” scene, in which wealthy, stubborn actress Joan Crawford (Dunaway) is angry at her little daughter, Christina, for having wire hangers in her closet. This is the scene that is often quoted mockingly and said to be so bizarre that it’s unintentionally humorous. That really surprises me. Yes, it’s a little confusing as to where Joan’s daughter’s wire hangers came from. Yes, the line is quite memorable. Yes, the scene is a little too over-the-top. But if you really look at this scene, it’s incredibly disturbing! I mean, you’ve got Joan yelling at her daughter for a ridiculous reason. That’s one thing. It’s another thing when Joan beats her with one of the wire hangers! This is a very unsettling, hardly watchable scene that features child abuse at its center. And it doesn’t stop there. She drags her out of bed and messes up the bathroom so she can wash it herself! Even poor Christina knows this is going too far! “Jesus Christ,” she says to herself tearfully. 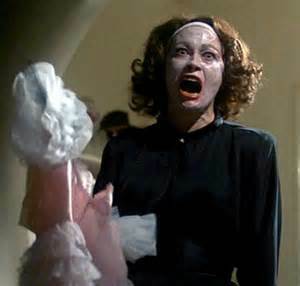 It baffles me how people have labeled “Mommie Dearest” a “cult classic” because of “campy” scenes like that. I have to wonder what movie they thought they were watching and what substance they were abusing while doing so. Okay, to be kind of fair, my guess is that it has to do with “shock value.” Aside from the wire-hanger scene, there are moments in which a mother angrily cuts off a lot of her daughter’s hair, tackles her to land on a glass table, and, in another “campy” bit, harshly cutting hedges out of anger. It’s like watching a “Friday the 13th” movie—its fan base sees the appeal in being shocked every couple of scenes. Because of this, “Mommie Dearest” is not the most effective kind of biopic. It’s supposed to show the truly complicated relationship between Joan Crawford and her adopted daughter Christina, as it only gets worse as time goes by due to cruelty and jealousy. But it goes so far at showing the terrible parts of the relationship that after a while, it’s hard to truly explain what it’s all about. There’s hardly a narrative flow here; it’s all one shocking moment after another without much ground. Most of these scenes don’t even have much of a buildup. They just happen. “Mommie Dearest” is a depressing film; one I wouldn’t want to revisit anytime soon. One viewing of it was enough for me. The film was so successful as an unintentional “comedy” that its popularity led to no Academy Award nomination for Faye Dunaway (which is one of the reasons she doesn’t like to talk about the film) but several Razzie nominations (and wins, for that matter). I can say this about Faye Dunaway’s performance, however. Dunaway clearly put her all into it, and in all fairness, it is a chillingly good performance. When you think about it, Joan Crawford was an over-the-top personality; therefore, Dunaway playing her as such is necessary. Dunaway should not be criticized for playing a loud, rough, even violent woman with some truly unnerving mental issues. I don’t even see Faye Dunaway in this film at all; I see Joan Crawford. (Oh, and thanks to sensational makeup, she even looks exactly Joan Crawford—another strange reason people make fun of this movie.) Too bad we only see her as a monster though. The film was based on a best-selling memoir, written by Christina Crawford, which only described her movie-star mother as such. That may be the film’s biggest problem. It’s too one-sided. I didn’t care much for this movie, other than to prove the point that I am definitely not part of this “cult” that holds it in high regard for all the wrong reasons (or the right reasons, for that matter). John Carpenter’s great 1978 chiller “Halloween” did not need a sequel. Sure, it was a box-office success, was the most profitable independent film at the time, and became the phenomenon that would create the “slasher” genre. But it didn’t need a sequel. It was fine on its own. But with all the trashy, deplorable “slasher” movies (movies in which dumb teenagers are stalked and sliced by some psycho) hoping to cash in on the film’s success, critics and cynics at the time must have hoped that “Halloween II” would at least show copycats of the original how to do this craft properly. But as it turns out, the film is only here as an attempt to cash in, just like the other movies of this sort. It’s a disappointing, repetitive, and (worst of all) boring thriller that lacks the tension and compelling nature of the original film. It’s as if they didn’t want to try so hard with this one because they knew that whatever they would make for a sequel to “Halloween,” it would make money either way. The eeriness is monotonous and not very tense. The characters are unbelievably dumb. The masked killer, the Shape, has lost his effectiveness as a menacing force, and has instead become a typical slasher-movie villain. Even the gore-level is turned up because apparently, blood and gore sells with audiences (those who are fond of the original remember how bloodless it is, and it had atmosphere and suspense to keep people tense). But wouldn’t you know! Michael Myers makes his way to the hospital and kills everyone he comes across! Wait, how did he know where Laurie was? Why does he still want to kill her? Well, so this sequel can be made, I guess. Anyway, Michael creeps about the hospital and kills off the people he comes across, while Laurie relies on her wits to fend for herself…Oh wait, I’m sorry; this time around, Laurie is a broken, catatonic fool who is about as complex as Barbra from “Night of the Living Dead.” Scenes that feature her in danger grow really boring as a result. 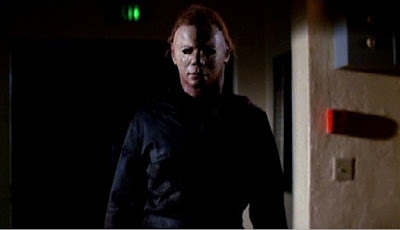 While all of this is going on, Dr. Loomis is still out to find his patient (Michael) and somehow stop him because he knows for sure that he’s alive because “he’s not a man—he’s evil!” (That’s one of many screaming rants he likes to deliver, including “I shot him six times!”) But soon, he learns of a family connection between Michael and…Laurie? Really? OK, it’s one thing to have a backstory over a character that didn’t need one in “Halloween,” but to have him related to Laurie is to give up hope for this movie. Have you ever seen a movie that has you invested for the first hour-and-a-half, but then a completely lackluster ending totally lets you down? “An American Werewolf in London” is an example of that kind of movie for me. It started and continued in an intriguing, entertaining way with a divine story and script, but the anticlimactic ending keeps me from recommending this movie. It’s as if the movie wasn’t finished and the filmmakers just made do with what they had. That’s a real shame because director John Landis had something good going here. It’s as if he spent too much time on sequences and special effects that he didn’t think to create a better resolution. Just when the last shot shows a quite unexpected anticlimactic image, boom! The credits roll! Why? Landis has made better movies, such as “National Lampoon’s Animal House” and “The Blues Brothers.” He had something good here- a “horror-comedy”; part comedy, part horror. The movie’s plot features two young American men, David (David Naughton) and Jack (Griffin Dunne), who go backpacking on the English moors in London. They run into a pub with strange locals with weird behavior. One of them warns the fellows, “Beware the moon and stick to the road.” They don’t. That’s when the howling is heard. A werewolf attacks the two—Jack is dead and David is severely injured. A few days later, David wakes up in the hospital where he falls for an attractive nurse (Jenny Agutter). But things go bad when Jack, now a decomposing “undead” corpse, visits David and warns him that on the next full moon, David will become a werewolf and kill people. He advises him to take his own life, and David doesn’t want to believe or listen to him. Some of the best moments in this movie belong to Dunne. Despite decaying in his corpse form, he still acts and talks like a college student. The very best things about this movie are Rick Baker’s spectacular and convincing makeup and effects. His creature effects and makeup help make for a terrific and horrifying scene in which David slowly but surely morphs into a werewolf. First, his hands grow into claws, then his feet become paws, and finally, his face changes into a face of fangs and a snout. It’s just so painful and it looks so convincing. The special effects here are definitely first-rate. “Raiders of the Lost Ark” is one of the best in a series of movies that feature action-packed adventures and a hero we can all root for. But there is a whole lot more to it too—it also features a great deal of imagination and a super-fast pace. This isn’t just a movie—it’s an event. We spend two hours having fun watching the main hero go through a series of adventures while also admiring what’s happening around him and then we get to go home. It’s as exciting as any sporting event. Watch it on the big screen, and tell me you’re not excited. For a hero, we have Dr. Indiana Jones (Harrison Ford), an archaeologist/college-professor who always gets in way over his head as he goes through dangerous lengths to unearth a hidden historic artifact—he comes complete with bullwhip, Fedora hat, and leather jacket. Oh, and he also has a fear of snakes, but why am I telling you that? In an opening scene set in South America, we see him explore a booby-trapped cave to find a golden idol. The treasure is left out in the open—this seems way too easy. And when Dr. Jones attempts to take it, this sets up a course involving spikes shooting out of the walls, a chasm, a slow-closing door, and the biggest boulder you could imagine. How could he possibly get out of this? The best thing about this movie is that while we know that he is going to get out of every situation he couldn’t possibly get out of, it’s great to see how he does. This sets up an exciting series of adventures, including a trap in near-darkness surrounded by hissing snakes and a chase scene involving a truck, a plane, and a horse. It all comes down to a race against time between Indy and Belloq as they race to retrieve the prize. 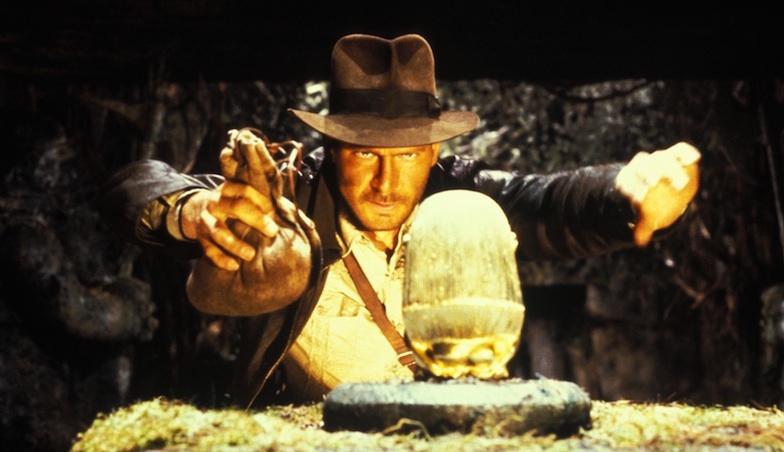 “Raiders of the Lost Ark” is also perfectly paced. In between the frantic action scenes is enough character development and minimum exposition. We get to know Indy and Marion and we fear for their lives. Credit editor Michael Kahn for creating such a fast pace and not making the movie seem out of control in its cuts. The performances are all solid. Harrison Ford, previously known for playing Han Solo in “Star Wars,” creates a different sort of action hero with strength and a taste for adventure as well as everyday man credibility. He’s also a rough scoundrel with a heart of gold. Karen Allen is the perfect ally for Indy. As Marion, Allen doesn’t play the worried girlfriend who is roped into these situations. She plays this character with energy and strength. Sure, she does scream from time to time but she’s definitely not the damsel in distress. She’s a strong, independent woman who can take care of herself most of the time. There are also memorable small moments in the film, along with the big action sequences we aren’t bored with. Examples are these little moments are Indy’s line to Marion, “It’s not the years, honey, it’s the mileage,” and a very funny brief showdown between Indy and a swordsman. (You’ll know what I’m talking about.) The movie’s spontaneity is also one of the best things in the movie. There are also plenty of special effects in this movie. The effects at the very end, a terrifying scene in which the Ark’s power is unleashed, are so realistic that they may frighten younger viewers. I am also very impressed at the stuntwork in the film. There is a scene in which Indy is being dragged along the ground behind a truck in a chase scene. I couldn’t tell which was Harrison Ford and which was his stunt double. But this whole scene was done without special effects—it was really happening. Someone really did get dragged along a road by that truck. There may have been pain but I suppose it was worth it to the actors and filmmakers to entertain us. Oh, and I should also mention the “Raiders March,” the theme music score composed by John Williams, who also composed memorable music from “Jaws,” “Close Encounters of the Third Kind,” “Superman,” and “Star Wars.” He scores another notable (excuse the pun) music score here. “Raiders of the Lost Ark” is an action movie with all the right ingredients—a smart script, a fast pace, a likable hero, a strong supporting cast of characters, incredible action scenes, a touch of comedy, a hint of romance, and not least of all, sharp direction by director Steven Spielberg and witty storytelling by George Lucas. Spielberg and Lucas have made an excellent piece of work together. I look forward to them making another collaboration. “On Golden Pond” is a collection of brilliant short segments that wraps around at the end so that the film has a linear story structure. It has a story with a beginning, middle, and end, but even between them, if it’s possible, the story has its own wraparound with the two central characters—an elderly couple who love each other to death. The couple is Norman and Ethyl Thayer (Henry Fonda and Katharine Hepburn). They’re long-married and still share strong simple affection for each other. But Norman is feeling like he’s getting older and it seems that she’s the only thing in his life that matters anymore. That’s good enough for him, since he gripes about everything else. Anyway, as the story opens, Norman and Ethyl arrive to their lakeside summer cottage near Golden Pond. It’s here that we see Ethyl’s free-spiritedness that apparently stays with age, and Norman’s shyness and stubbornness towards pretty much everything, even Ethyl. He knows he’s getting older and we suspect that he doesn’t see what one more summer at this old place will do to him anymore. But Ethyl assures him that he’s her “knight in shining armor” and will always be. That’s the opening segment of the film, which could make for a short film of its own. By the time it gets to that pivotal scene, we feel like these two characters have been developed and we like them almost as much as they like each other. But this is just the setup for the real story, which begins as Normal and Ethyl’s grown-up daughter Chelsea (Henry Fonda’s real-life daughter, Jane Fonda) arrives to the cottage to celebrate Norman’s birthday. She brings along her new boyfriend Bill (Dabney Coleman) and his thirteen-year-old son Billy (Doug McKeon). And this is where the conflicts are established. We discover that Chelsea feels resentment towards her father, as Norman has never really given Chelsea her due. It’s as if he really wanted a son to bond with, or he just never really understood how to be a father. The midway point arrives as Norman and Ethyl agree to let young Billy stay with them while Chelsea and Bill take a trip to Europe. Of course, with no TV and no “chicks” to “cruise” (he’s from San Francisco, where he and his friends “cruise chicks”), the kid acts like a brat. 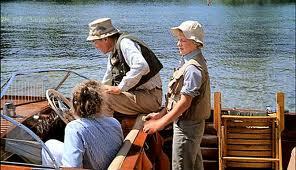 But with some pushing from Ethyl, Norman takes the kid fishing, and the two develop a sort-of father/son relationship together. They bond together, share communication, and trust each other. Later, Norman has learned how to be a father. By the time Chelsea returns to pick up Billy, she notices the friendship between her father and her new stepson (she married Bill in Brussels, as it turns out), and is even more resentful because Billy is having the relationship with Norman that she never had. But maybe there’s still time for reconciliation. When Norman and Ethyl are alone again at the cottage, the story ends with the payoff of Norman’s realized mortality. Even though it’s predictable, it’s touching nonetheless. When “On Golden Pond” is over, we feel like we’ve spent time with warm, appealing characters in a peaceful place like Golden Pond. The emotions are there and you feel good about yourself while watching this film. The performances are first-rate. Henry Fonda and Katherine Hepburn share amazing chemistry together and share distinct characteristics that make them memorable. A lot rides on these two veteran actors and there’s nothing short of greatness for them. Jane Fonda acquits herself nicely to the role of Chelsea, Dabney Coleman shares a great scene with Henry Fonda about asking permission to sleep in the same room as Jane (the questions and reactions are just fantastic), and Doug McKeon does more than expected with the plain role of the kid—he starts out as a bratty tyke, but becomes likeable as his coming-of-age story continues. I heard that this is the only film featuring Henry and Jane Fonda together. Maybe some of the character Chelsea’s resentment is reflected from a possible, similar relationship between these two. Whatever the case, having this father and daughter together in the film just adds to its effect. “On Golden Pond” deals honestly with its issues of relationships, resentment, realization, and mortality, while also showing that life can be beautiful, even if things don’t go as planned. With great acting, nicely staged scenery, and a darn good screenplay, “On Golden Pond” is a real treasure of a movie.